Since I pick up plants from here and there I am always being surprised. 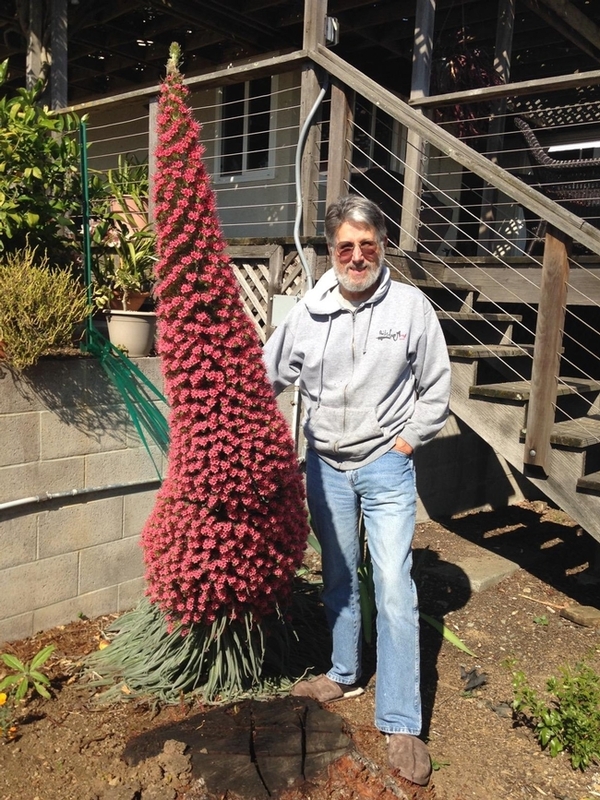 I found this particular plant in its small form, an Echium fastuosum, It is a very popular part of the city landscape in Benicia. Very easy to see in its blooming stages by the side of the road. I thought that would be nice to have closer to home. I purloined one from a street near my house, popped it in the ground, and forgot about it. At least I lost track of it for a few months and then I realized that it was getting larger and larger and taking advantage of good soil and general fertilizer to get bigger and bigger. I thought, well this will be nice to see grown up fully. Besides, it was another relative, I assumed because the foliage was similar. But there was something different about it. Little by little, it developed into a spike – and it didn't stop growing. I felt like this was right out of a fairy tale – it just didn't stop getting taller. Finally, I was dwarfed by a handsome spike which it took a bit of investigating to pin down: Echium wildpretii. Affectionately, Tower of Jewels. To add to my surprise, I noticed a couple of other specimens in other parts of Benicia. It turned out not to be so rare after all. My main point here is the fun and value of surprises to be found in the garden. Sometimes the truth is not revealed until the growth is over and done with. Oh, my goodness, unbelievable! What a tall tale, literally. So enjoyed your post. Please let me know where I can pilfer one for my front yard. Just kidding. So cool Lowell! So glad that you received a treasure for your "pirating". Have you noticed any pollinators attracted to it?